This weekend I went over to my friend, Alexis’ house and we baked some monster cookies together. I’ve been wanting to do a video with Alexis for a while now- she makes even the simplest things taste good. In fact, the sugar cookie recipe I used in one of my videos was introduced to me by her. She’s a bit camera-shy, but don’t let that deceive you. Whenever it is someone’s birthday, Alexis always likes to bring them something special. I remember her bringing a rainbow cake once to school for a friend’s birthday. Alexis is not only a fantastic baker, she’s got a heart of gold and is very helpful. She always shares her American candy with everyone. I don’t think I’d do that. These cookies are full of different colours and they are so creative! There hundreds of cookies out there- so why not create an amalgamation? 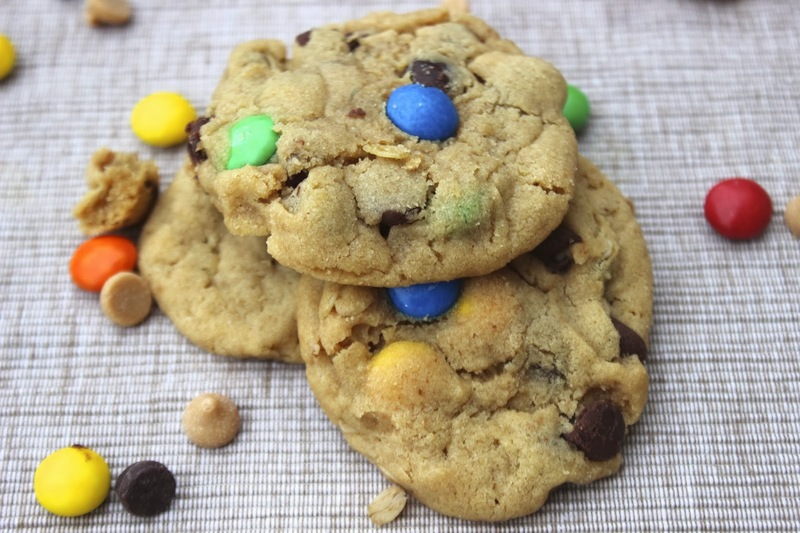 These are a blend of peanut butter, M&M, chocolate chip and oatmeal cookies. They are soft, buttery and super delicious. I’ve never used peanut butter chips in a cookie and I had some lying around at home and didn’t know what to do with them- so we decided to use them in this video. I loved how they added a burst of saltiness to each bite. peanut butter and something else like a chocolate spread. I’d say add Nutella but that has nuts too. Regardless, you can put just about anything into these cookies- we also thought of chopping up Oreo cookies and adding them. You could also do caramel bits. Don’t go too overboard though. Remember to bake the cookies for ONLY 9-10 minutes- they may look underdone, but that’s okay as they will harden as they cool. The last thing you want is a cookie that snaps your braces. Trust me, I’ve done that. My sister was the unfortunate victim. Not going happening again. I found this recipe on Mrs. Schwartz’s Kitchen, and I also went to Sally’s Baking Addiction. The recipe on both sites was more or less the same, and I’m not sure who the original author is. But I (and I’m sure Alexis does too!) certainly recommend this recipe. The Cookie Monster would definitely approve. Preheat the oven to 350 F or 180 C and line 2 cookie sheets with parchment paper. In a bowl, combine the flour, salt and baking soda. In another bowl, cream together the butter and sugars. Add in the peanut butter, vanilla and egg and mix until well-blended. Dump in the flour in three batches and mix after each addition so that it doesn’t explode and cover your face. Fold in the oats, chips, M&M’s and any other bits and pieces you may want to add. Place 2 tbsp sized balls onto the cookie sheet, spread around 2 inches apart. If your dough is too soft to work with, refrigerate for 30 min. Thank you these are SO GOOD! I made them with white choc chips and extra m&ms and they’re my favourite cookies so far.